We all worry about reviews … the ones that come from your supervisor, of the hotel we are planning to book, the movie we are hoping to see. And as writers, we are particularly sensitive to reviews of the paragraphs and pages we have labored over. The brittle, sepia tone photograph said everything about who I would become. 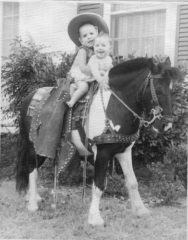 Perched in front of my brother, I am sitting astride a pony for the first time. My first horse was a handsome Arabian.